I live in a rural neighborhood that seems a little out-of-touch with the world. It is a step back in time to when neighbors actually knew and cared for each other. I knew it was a little unusual when on moving day, the next door neighbors showed up to help move me in. The neighbors are a family of 10 so there was a lot of help and they made short work of it and even left a "Welcome to the Neighborhood" card with a gift certificate to a local restaurant. The family is home-schooled and home-churched and I'm not sure I've ever met nicer or harder-working kids. It's a dog kind of neighborhood so we've met a lot of the neighbors on our dog walks and these have turned into several house visits, loaning of tools and equipment, taking care of animals when someone travels, and in general knowing what's up with each other. While we were talking, another neighbor walked up with his dog. We hadn't met him or Buster (his dog) so we exchanged the normal round of dog talk and general "where are you from and how long have you been here?" information. At the end of this conversation, he invited us to a "turkey fry" ... his family always deep fries their turkeys so they've opened it up to the neighborhood. They do the oil and anyone can bring a turkey and fry it and spend the "three minutes per pound" time chatting and catching up. We didn't get to make it to the turkey fry but we did give thanks for being part of a such a welcoming, friendly neighborhood. About the Image: I missed my aspen fix this fall so I've had to revisit old ones. 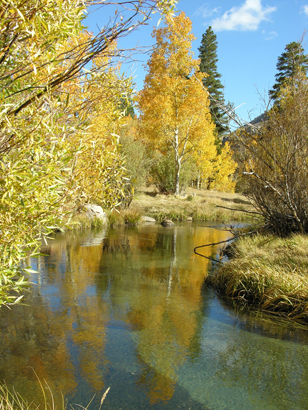 This one is from South Lake, near Bishop, CA. I think you're living now in a special place, and such joy it seems to bring you. One of my best memories is traveling in Colorado and seeing the aspens. They're marvelous. Joyceann, the joy of being in this place you now call home resonates with every word -- and makes me want to be there too! love those gorgeous yellows and reflections; so beautiful!